Sweet strawberries and tart kiwifruits come together in this refreshing and healthy Strawberry Kiwi Smoothie recipe. 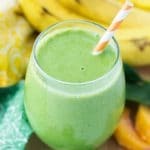 It’s a great drink for the kids instead of sugary slushies! 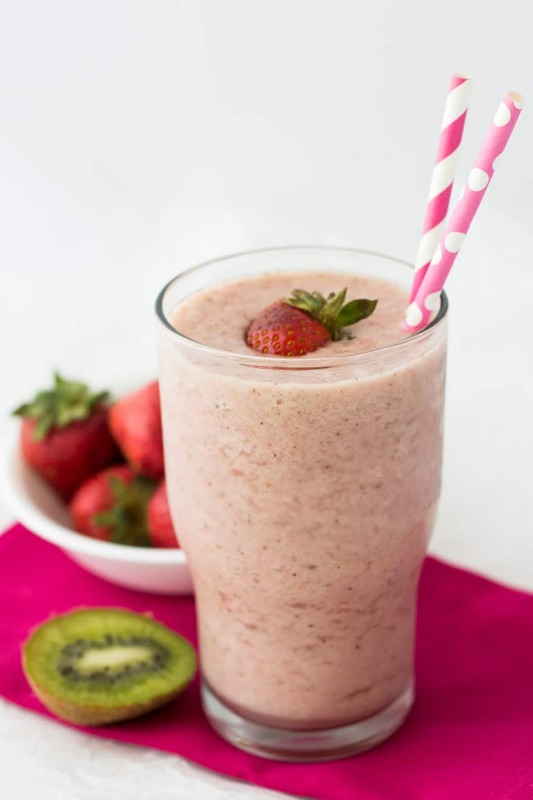 The combination of strawberries and kiwis is one of my favorites for drinks. You can leave it tart (my preference) or add a bit of honey to sweeten it for those who like it sweeter (like my husband and son). Or, as an alternative sweetener, throw in half or a whole banana or a date or two. 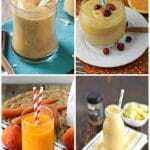 There are so many ways to sweeten smoothies without going the sugary route! However, I do tend to stay away from adding bananas unless I want the flavor of the banana in with the other fruits. Unlike honey, I think banana is usually the predominant flavor when you add more than half of one. 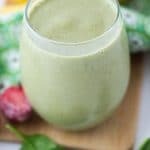 The best thing about this smoothie? It tastes like a treat without tons of calories. When I’m craving something sweet, this satisfies in a pinch. You’ll also get more than enough vitamin C because of the kiwi, so it’s no wonder this little fuzzy fruit is one of my favorites. Enjoy it for breakfast, after a workout or any time of day, really. If you’re drinking it after a workout, you could even add a scoop of vanilla or banana protein powder for an extra punch of protein. I know I could use a little more protein in my diet on most days. 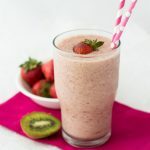 This strawberry kiwi smoothie is a delightfully sweet and tart drink that'll refresh and satisfy. 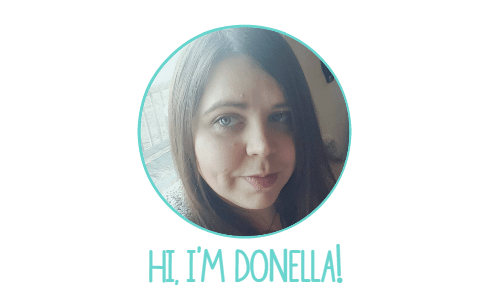 It's sweetened with honey rather than unhealthy sugars or sugar substitutes. 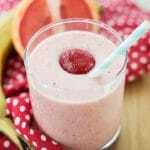 Place fruit, yogurt and ice in blender. Blend until smooth (about 1-2 minutes). Add honey to taste. You may need more or less than the suggested 2 tablespoons. 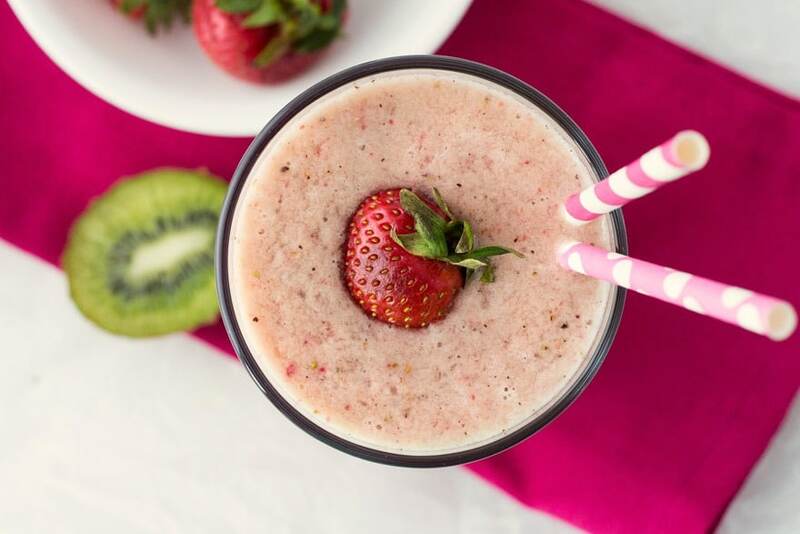 Quick tip: You can give this more of a slushie vibe by adding frozen fruit or more ice. This is the way my son prefers it because it has the consistency of the slushies he’s used to without all the sugar. Win for Mom and kiddo!